The 2014 budget did serious damage to Commonwealth-state relations and the confidence with which states could plan and manage health services. It did this by abrogating an agreement about public hospital funding which had been signed by governments of all political persuasions and unilaterally imposing a new funding model on the states. 3.1 The previous chapter provided the historical context of hospital funding in Australia, and the struggle to find an agreement between levels of government about funding responsibility. As noted in Chapter 2, a forum for cooperation between federal, state and territory governments was achieved in 2011 when all parties signed the National Health Reform Agreement (NHRA). As a result of this agreement, long term funding certainty, through until at least 2024-25 was achieved for hospital funding. issues that have emerged or been exacerbated by the removal of certainty in hospital funding. 3.3 A key element in the Coalition Government's justification of the cuts to hospital funding was the argument that government expenditure on health was unsustainable. The same argument was used to justify the $7 co-payment policy, later scrapped, and the continuing freeze on MBS indexation. The Government has justified its extreme health savings measures on the claim that Australia’s health spending is unsustainable. But Australia’s health financing arrangements are not in crisis. In 2012-13, Australia had the lowest growth (1.5 per cent) in total health expenditure since the Government began reporting it in the mid-1980s. Without any specific Government measures, there was negative growth (minus 2.2 per cent) in Commonwealth funding of public hospitals in 2012‑13, and only 1.9 per cent growth in 2011-12. Our health sector is doing more than its share to ensure health expenditure is sustainable. Australia's expenditure on health has been stable as a share of GDP, growing only one per cent over the last 10 years. Health expenditure does not demand radical changes to existing services. 3.5 Compared to other OECD countries, Australia spends just below the OECD average for health funding. In 2015, Australia spent 9.7 per cent of GDP on health, while in comparison the US spent 16.4 per cent of GDP, Canada spent 10.2 per cent, and the UK spent 8.5 per cent. The OECD Health at a Glance 2015 notes that Australia's health expenditure 'achieves good outcomes relatively efficiently'. State Governments have primary responsibility for running and funding public hospitals and schools. The extent of existing Commonwealth funding to public hospitals and schools blurs these accountabilities and is unaffordable. 3.8 As part of the 2014-15 Budget, the Federal Government pledged that from 2017-18 Federal Government funding would revert to the former block funding model based on indexation at the Consumer Price Index (CPI) and population growth. Despite promising "no cuts to health", the Federal Government projected that this new funding arrangement would save over $57 billion between 2017-18 and 2024-5. 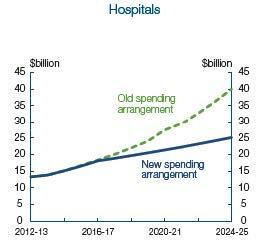 Figure 1, reproduced from the 2014-15 Budget Overview, shows the government's projected reductions to hospital funding. ... a combination of the Consumer Price Index and population growth. If this is taken at face value, then the 2014 proposal is the most parsimonious indexation arrangement that has ever applied to public hospital funding grants. 3.10 The Budget Overview went on to explain that the responsibilities of the different levels of government would be the subject of a White Paper on the Reform of Federation, to be completed at the end of 2015. The recently abandoned White Paper process is discussed further below. 3.11 The committee sought a submission from the Parliamentary Budget Office (PBO) in order to gain a clearer understanding of the impact the Coalition Government's funding cuts will have on each state and territory. The submission is reproduced at Appendix 4. Figure 2, which is based on the PBO's findings, shows the funding each state and territory will lose as a result of the 2014-15 Budget. 3.12 The funding cuts calculated in the PBO's submission relate to the 2014-15 Budget decision. These preceded the April 2016 COAG agreement to partly reinstate funding out to 2020. While this COAG decision, discussed below, has partially mitigated the 2014-15 Budget cuts, the $2.9 billion allocated across three years (2017‑18 to 2019-20) is not adequate to address the $7.9 billion shortfall over this same period created by the 2014‑15 Budget cuts. 3.13 During its inquiry, the committee has undertaken 52 hearings and held public hearings and site visits in every state and territory. The following eight chapters focus on each of the states and territories, detailing the extent of the loss of funding and the issues which have arisen for each state. While state governments have, to a large extent, provided short-term additional funding to cover the immediate Commonwealth shortfall, this situation is unsustainable long term. The loss of certainty over long term funding has also meant that state governments are unable to forward plan workforce and infrastructure and must subsist from budget to budget. 3.14 In addition to state-specific issues, there are also some issues caused by the cuts to hospital funding that are Australia‑wide. These range from high-level policy questions, such as the need for a mechanism for cooperation between the states and federal governments, to grassroots impacts, such as increased waiting times. These national implications are discussed throughout this chapter. 3.15 As described in Chapter 2, the history of hospital funding in Australia has been marked by a struggle to find a means of settling the respective contributions of the state and federal governments. Of particular importance has been the need to avoid short-term funding agreements and instead establish sustainable long-term funding arrangements. ...abrogating an agreement about public hospital funding which had been signed by governments of all political persuasions and unilaterally imposing a new funding model on the states. The funding model promulgated in the 2014 budget was presented in the budget papers as saving more than a billion dollars over the forward estimates, with savings described as being in the tens of billions over the ensuing decade. The words 'saved' and 'savings' are an example of creative accounting. They are savings to the Commonwealth budget only, but are not real savings to the public purse at all. Instead, they are simply a massive and unsustainable transfer of costs from the Commonwealth budget to state budgets. ...creating an alignment of incentives. It made the Commonwealth share directly in the costs of activity growth in health care, which gave it an incentive to develop policies in its sphere that might mitigate that growth. For example, the Commonwealth traditionally funds primary care, while the states fund hospital care. Making the Commonwealth share responsible for hospital funding gave it a stronger incentive to improve primary care and reduce the number of avoidable and expensive hospital visits, generating actual savings to the public purse. The 2014 budget removed that alignment of incentives. 3.19 In the two years since the 2014-15 Budget, there has been much debate about the role of the Federal Government in hospital funding. The Reform of the Federation White Paper process has been part of that debate, although not to the same extent as the ongoing criticisms of the 2014-15 Budget by groups like the AMA. 3.20 The White Paper process was begun in the first half of 2014. Its main objective was to 'clarify roles and responsibilities to ensure that, as far as possible, the states and territories are sovereign in their own sphere.' Other objectives included reducing duplication between levels of government and improving the efficiency of the federation. 3.21 As part of the White Paper process, issues papers regarding various aspects of the federation, including health and hospital funding, were produced in the second half of 2014. However the Green Paper, which was to be released in the first half of 2015, was not published until after it had been leaked in June 2015.
states take full responsibility for public hospitals. 3.23 It had been anticipated that federation reform would be part of the COAG leaders' retreat on 23 July 2015, but the topic was not covered in the communique for that meeting. Reform was discussed at the 11 December 2015 COAG meeting, but leaders only agreed to further consideration of health funding at the first COAG meeting of 2016. 3.24 The White Paper on federation reform had been scheduled for publication at the end of 2015, but this did not happen. Instead, a variation of the options in the 'discussion paper' was put to the COAG meeting held on 1 April 2016, leading to an agreement to extend activity based funding to 2020 (discussed further below). 3.25 On 28 April 2016, the Prime Minister confirmed that the Reform of Federation White Paper process had been scrapped, with no White Paper to be released. The cost of the process was reported to be in excess of $5 million. ...work to improve federal financial relations and the transparency of government spending will be progressed by the Council on Federal Financial Relations, and the Commonwealth, state and territory Treasuries. A progress report will be brought to the next COAG meeting. 3.27 The Reform of Federation White Paper could have been a valuable process for rebuilding state-federal relations after the disastrous 2014-15 Budget. Instead, it has been significant waste of public money, and has only resulted in returning state-federal relations back to the often combative forum of COAG. 3.28 On 1 April 2016 the Prime Minister, the Hon Malcolm Turnbull MP, faced a hostile COAG meeting with states and territories concerned that the 2014-15 Budget cuts to hospital funding would leave them unable to provide adequate hospital services. The Prime Minister's proposal to the states was for an additional $3 billion over three years for hospital funding, and the possibility that the states could raise their own income taxes as funding for the longer term. 3.29 While the income tax proposal was rejected by the states, COAG did agree to a Heads of Agreement for hospital funding to run from 1 July 2017 to 30 June 2020 'ahead of longer-term arrangements'. Additional Commonwealth funding under the agreement was to be $2.9 billion between 2017-18 to 2019-20, with growth capped at 6.5 per cent per year. The funding was to be provided primarily on the basis of activity based funding and block funding under certain circumstances as set out under the NHRA. reduce the number of avoidable hospital readmissions. 3.31 Although the April 2016 agreement provides partial and short-term respite from the full force of the 2014-15 Budget funding cuts, the additional funds in the agreement fall well short of the funding states would have accessed under the NHRA. Instead of the NHRA's funding increase of 9 per cent per annum, the states will see funding growth capped at 6.5 per cent, only 2 per cent improvement on the 4.5 per cent rate unilaterally imposed by the 2014-15 Budget. 3.32 As discussed earlier, the additional $2.9 billion figure compares poorly with the funding increase of $7.9 billion which would have flowed to the states had the government not abandoned the NHRA. 3.33 The April 2016 COAG agreement is welcome in that it is an improvement on the hospital funding cuts contained in the 2014-15 Budget. However, it does not go towards solving the larger problem: that a long-term funding agreement is urgently needed to replace the NHRA which was abandoned in the 2014-15 Budget. It is clear that where the Commonwealth provides funding it is welcome by the state. However, South Australia and SA Health is keen to ensure that any benefits of reform measures...are durable in the long term. SA Health's ability to undertake budgetary and service planning is compromised by uncertainty created by the Commonwealth. Uncertainty remains about public hospital funding. National Health Reform Agreement arrangements are unlikely to be clarified until the release of the Commonwealth's white paper on the reform of the federation in 2016. SA Health looks forward to the ideas to be presented by the Commonwealth about future roles and responsibilities for the health system as part of this process. The present situation leaves the state bearing the risks associated with growing demands on hospital costs and without the resources to meet the expected growth. The state has had limited ability to influence the full range of policy levers across the health system as a whole that drive demand and public hospital services. This is not a sustainable process for the health system in the future. The adoption of activity based funding as the basis for Commonwealth funding contributions in 2011 signalled a commitment to carry a share of hospital demand growth. To give that some perspective, Commonwealth funding for public hospitals grew by an average of 6.6 per cent per annum for the decade to 2010-11, growing to 7.1 per cent per annum to 2013-14. And growth was estimated at 9.4 per cent beyond the 2013-14 forward estimates, based on projected growth for Victorian public hospitals published in the 2013-14 MYEFO. ...created the financial incentives for all levels of government to work together to ensure the health system functions efficiently and holistically to improve overall health outcomes. Furthermore, the methodology accounted for all the main drivers of public hospital service cost growth, because it is based on the actual increase in the volume of public hospital services provided to patients. ...the major costs associated with other drivers of healthcare demand would be borne by the states and territories, leading to an ever-increasing share of state funding and a declining Commonwealth share. The proposed funding model assumes that all population groups have the same need for public hospital services. For example, it does not take account of the greater health needs of Indigenous people and people from rural and remote locations. This is particularly important for Queensland, which has the most decentralised population in Australia. Nor does it take account of the ageing population or the changing cost of service provision due to technological advances. 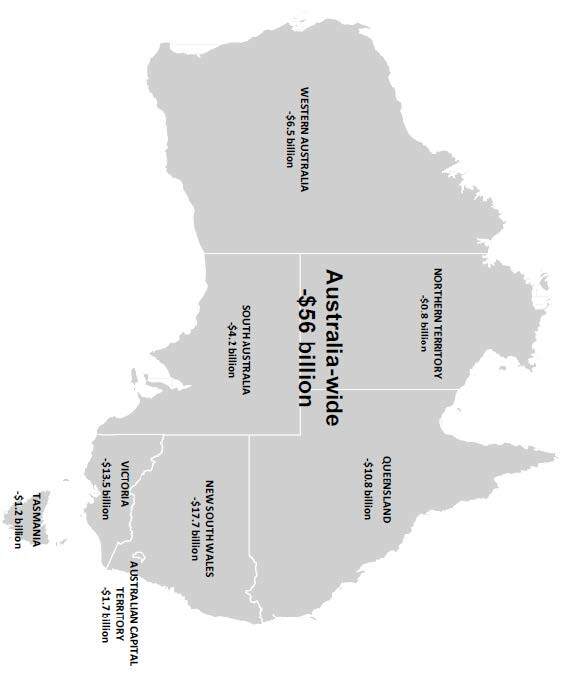 3.38 Chapters 4 to 10 of this report provide details of the impact of the Federal Government's hospital funding cuts on each state and territory. While the cuts had not been due to begin until 2017-18, the announcement of the decision in the 2014-15 Budget included the removal of many of the National Partnership Agreements which had provided funds to states and territories as part of the NHRA. The effect of the funding cuts was therefore immediate, and states had to begin planning for how to make up the shortfall in funds. Contrary to comments made by the Prime Minister today, the pain from these front line service cuts will start being felt by the States and Territories from July 1, 2014. Let’s look at two examples. In 43 days time, the Territory stands to lose $1.4 million in Federal funding for pensioner concessions and health funding will be cut by $33.8 million or the equivalent of a minimum of ten hospital beds. These funding decisions will have a real and immediate impact on the front line services offered to Territorians. 3.40 Many states pledged to cover the immediate funding gap themselves; however, that situation is not sustainable beyond the very short term. Issues have already begun to emerge which demonstrate that without a state-federal funding partnership, the states cannot adequately support Australia's hospitals. 3.41 Since its establishment in June 2014, the Senate Select Committee on Health has seen other disastrous health policies from the 2014-15 Budget scrapped or put on hold. But while the government has reversed ill-conceived policies like the $7 co‑payment, the cuts to hospital funding have lasted until 2016, when backlash from the states forced the government to make a temporary and partial extension of funding. 3.42 Before the NHRA was agreed in 2011, respective hospital funding contributions had been a struggle between the state and federal governments. The reforms to hospital funding implemented by the previous government allocated virtually equal responsibility for funding to the state and federal governments, and created a mechanism for all parties to work together to ensure that funds were used efficiently. 3.43 When the Federal Government unilaterally tore up the NHRA in the 2014‑15 Budget, the action set hospital funding arrangements back ten years. The decision obliterated states' confidence in any federal-state funding negotiation process. State hospital infrastructure and workforce planning, which was appropriately based on the long-term funding agreement in the NHRA, was thrown into uncertainty. State governments struggled to figure out how to make up the shortfall in funding; many admitting that it would not be possible unless funding was taken from other areas. establish an activity based funding model and the associated national efficient price for hospital services. created a shortfall in hospital funding that the state governments are struggling to cover. 3.46 The Federal Government claimed in 2014 that the Budget measures were put in place because health funding was unsustainable. In actual fact, the 2014-15 Budget has created the situation where hospital funding, with the burden shifted significantly to the states, is unsustainable. 3.47 Although the COAG agreement of April 2016 has partially mitigated the damage done by the 2014-15 Budget, the future of hospital funding is bleak. At best the three year agreement has created space for the federal government to work to rebuild the confidence of the states and establish a long-term agreement on hospital funding, backed by fair, equitable and sustainable federal funding. 3.48 As the following chapters of this report show, the NHRA had been working effectively to distribute funding in a responsible and equitable way to public hospitals. The Coalition Government unilaterally scrapped the NHRA and replaced it with what can only be described as an omnishambles or 'a situation that has been comprehensively mismanaged, characterised by a string of blunders and miscalculations'. 3.49 The committee believes that there is only one way Commonwealth-state hospital funding arrangements can be repaired, and that is to work through the NHRA. The committee's recommendations go towards this goal. 3.50 In building on the NHRA, rather than the omnishambles created by the 2014‑15 Budget and the Government's misguided actions since, the committee believes that the Federal Government needs be a partner with the states in terms of hospital funding. Without 'skin in the game', there is no incentive to work with state governments to ensure that funding is used efficiently. The Federal Government needs to urgently build goodwill with the state and territory governments, in order to create a solid foundation for any future finding agreement. 3.51 The committee recommends that the Government reconstitute the National Health and Hospitals Reform Commission or a similar body to review hospital funding arrangements and build on the National Health Reform Agreement. This process should be guided by the principles of equity, fairness, adequate funding and long-term certainty to ensure the continuity of public hospital services. 3.35 While the committee is pleased that the Federal Government has made a temporary agreement with the states until 2020, which partially restores the withdrawn NHRA funding, the committee believes that this is not sufficient. Until recently, the Federal Government was actively working to remove the mechanisms by which activity based funding was set up. The committee urges the government to halt the closure of the Independent Hospital Pricing Authority, and the other structures put in place by the former government to implement activity based funding. 3.52 The committee supports activity based funding as the best means of delivering limited funds in a manner that drives greater efficiencies and provides a strong incentive for the Commonwealth to improve primary care and reduce the number of avoidable and expensive hospital visits. 3.53 The committee recommends that the Government urgently give an undertaking that the mechanisms for activity based funding, such as the Independent Hospital Pricing Authority, and the other structures put in place by the former government to implement activity based funding, will not be dismantled.